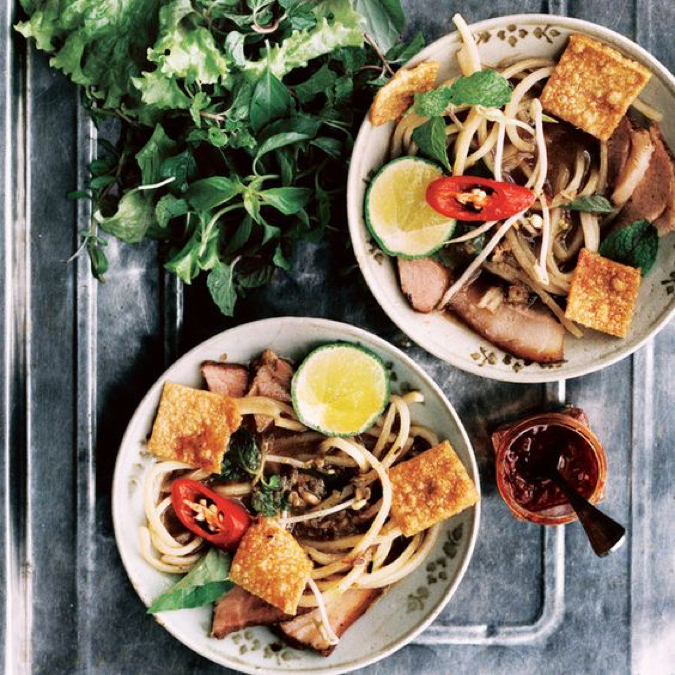 You can’t visit Vietnam without spend time exploring a Vietnamese food. Traditional Vietnamese food are all about the balance of fresh ingredients, intense flavours, and ease of cooking and preparation. Each dish has a rich history and represents a regional specialty; there are also many dishes that change depending on where you order them. These recipes have been passed down through families and communities in the past generations, and are now daily staples. There are so many beautiful dishes to sample, but we have curated the seven most popular traditional Vietnamese food to sample on your adventures. 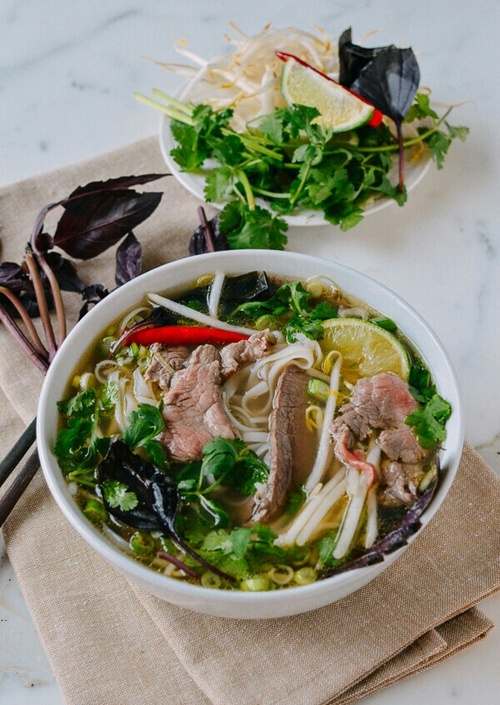 The origins of pho can be traced back to Northern Vietnam from hundreds of years ago. Legend has it that pho was created as a quick and easy sustenance for the army troops during the wars. The key element of any bowl of pho is the broth made of cloves, cinnamon, and star anise simmered with beef bone for days at a time. This may seem like extensive preparation, however it is thanks to the length of time creating the broth that it has such a sweet and complex flavor. When pho is served, you immerse layers of thin rice noodles and thinly sliced beef cooked medium rare in the hot broth and in the South of Vietnam you season the soup with fresh thai basil and mint ripped into the bowl. Northerners prefer their pho with no herbs or vegetables, and let the flavors of the broth guide the meal. You can find a bowl of pho anywhere in Vietnam as it is one of the most popular meals for breakfast or lunch, and if you go to a local street vendor it will only cost you $1 to $3 a bowl. Pho originated in the North of Vietnam but every region has their own style and take on the dish. There is a famous pho restaurant in Ho Chi Minh City that all the locals know about. Unchanged over the past half a century, this pho restaurant is revered for its high quality beef, large portions, and fast service. Head on down to Pho Hoa Pasteur, 260C Pasteur Street, Q3, HCMC to sample for yourself the soup that has passed the test of time. A favourite of millions, com tam is a simple delicacy developed during the French colonial period by the Vietnamese working class. The Southern workers discovered they could use the fractured rice grain as a delicious, dietary staple. Com tam, or broken rice, includes grilled pork chop, steamed egg, shredded pork, as well as cucumber, pickled vegetables, and fish sauce. This dish is typically served with a fork and spoon, as opposed to chopsticks, due to the French influence from where it originated. A Southern classic, com tam is notoriously hard to find in the center or north of Vietnam, but when you can find a vendor is will only cost you about $1.5 – 2 and make it one of the most affordable traditional Vietnamese food. Feasting on com tam means experiencing a combination of textures and flavours. Though you can find com tam on almost any Saigonese street corner, there are some outstanding places to find an extraordinary experience. Our favourite is hidden away from the usual tourist traps in the center in District 3 and the family running the restaurant for more than 40 years, with most of their reputation garnered from word of mouth praise. If you’re craving a cheap yet satisfying meal, be sure to check out this spot. The address is 260 Vo Van Tan, District 3, Ho Chi Minh City and is reachable by a taxi in ten minutes from District 1. Driving through the streets in Vietnam early in the morning, there is one dish you will see more than anything- the fantastically simple banh mi. 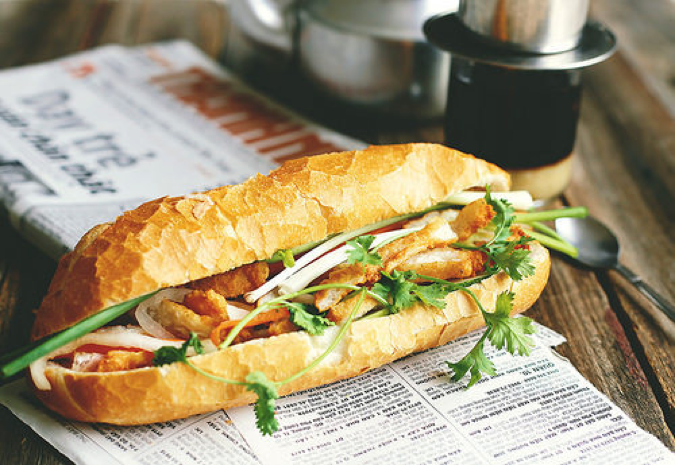 This sandwich can also be traced back to the French colonial period, even through the roots of the name; banh is pronounced similarly to the French word for bread pain and literally translates into “bread made from wheat.” Initially this dish was imported and only sold by expensive bakeries, however it began to spread to the masses when the Vietnamese working class discovered ways to change the ingredients and make it more accessible. Today the typical Vietnamese banh mi consists of mayonnaise, pate, sliced ham and pork, pickled vegetables, coriander, and hot sauce. The fusion of flavours between the Vietnamese fillings and French baguette makes this delicious meal a favourite of many. Banh mi is one the most common traditional Vietnamese food and it is acceptable to eat it at anytime during the day, for breakfast, lunch, dinner, or as a midnight snack. In Vietnam, you can easily find banh mi stalls almost any corner of the busy intersection for less than $2. When you visit, there is one shop that you cannot miss out on as it has been voted the best banh mi by Anthony Bourdain when he visited Vietnam: Banh Mi Phuong, 2B Phan Chau Trinh – TP, Hoi An. Bun Bo Hue literally translates as beef noodle soup from Hue, a central city in Vietnam that was once the ancient capital and a main base of many Vietnamese flavours. The history of bun bo Hue is relatively unknown, but it is rumored that it was invented hundreds of years ago by people moving from Northern Vietnam to the South. The broth is the backbone of bun bo Hue, as is typical with many distinct Vietnamese soups like pho. To prepare the broth beef bones must be simmered for hours with lemongrass and seasoned with fermented shrimp sauce. It is this combination that creates the distinct taste of the dish, that is then served with rice vermicelli noodles, thin slices of beef shank, cha, a mix of mint, basil, coriander, and bean sprouts. A delight for the eyes and the taste buds, no picture can convey the true deliciousness of bun bo Hue. 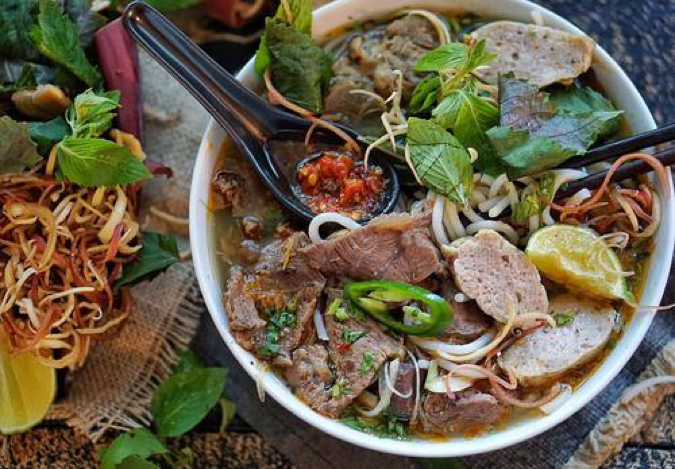 Though this dish originated in Hue, there are delicious versions of it all over Vietnam, and in our opinion some of the best bun bo Hue in Ho Chi Minh City can be found. Take a visit to Nhan Tri (295 Le Hong Phong, Ward 2, District 5) which is only 15 minutes away from the center of Saigon, to discover the rich taste and large portions that are adored by locals. Bun cha became an international attention overnight after US President Barack Obama and celebrity chef Anthony Bourdain were pictured eating the dish together in Hanoi. 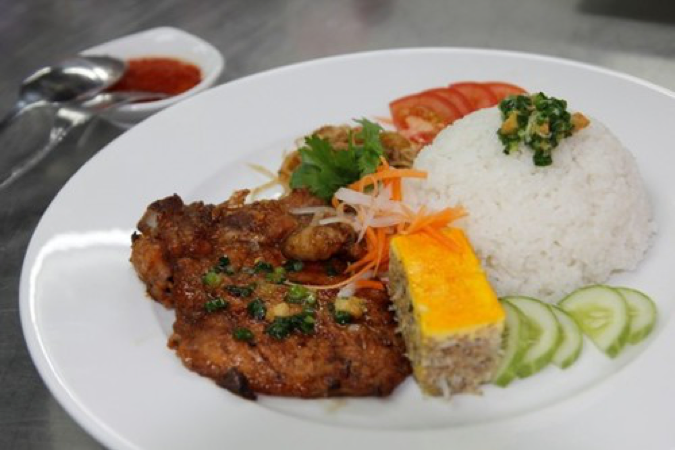 Their choice of this dish is now surprise as bun cha originated from the Old Quarter in Hanoi and has been one of the city’s signature dishes for hundreds of years. What makes this dish special is the intense preparation involved in making it; minced pork must be marinated overnight to fully absorb the flavor of herbs and shaped into balls, keeping attention to make sure the meat is tender and juicy. The sauce is what makes the dish spectacular; a good sauce will give a balance between the sweetness of the meat and the saltiness of the fish sauce. 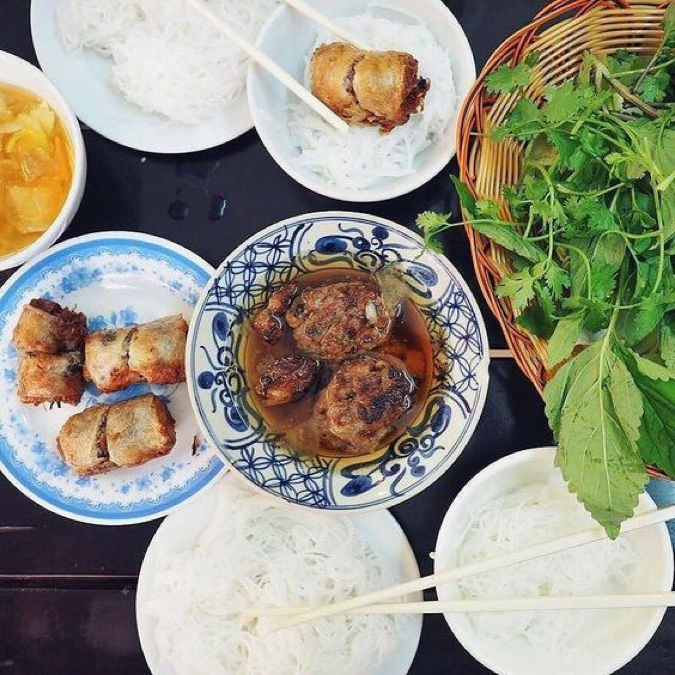 The Hanoi traditional dish is served only at lunchtime and comes with rice vermicelli, fresh vegies and herbs such as basils, coriander. Bun cha creates a strong hype among travelers after Obama’s visit to Vietnam. Bun cha can be found almost anywhere in the Old Quarter area of Hanoi, however if you want to dine where Obama and Bourdain did you will want to check out Bun Cha Huong Lien on 24 Lê Văn Hưu, Phạm Đình Hồ, Hai Bà Trưng, Hà Nội and just order Obama combo (including 2 portions of bun cha and spring roll, plus 2 beers) which set them back $6. If bun cha itself cannot satisfy your Hanoi food crave, visit our top 10 Hanoi authentic food experiences and add into your bucket list. This savory pancake originates from the Mekong Delta and is extremely popular in the Southern and Central regions of Vietnam. The dish gets its name as xeo is the sounds of the batter sizzling in the hot oil as it cooks to crispy perfection. 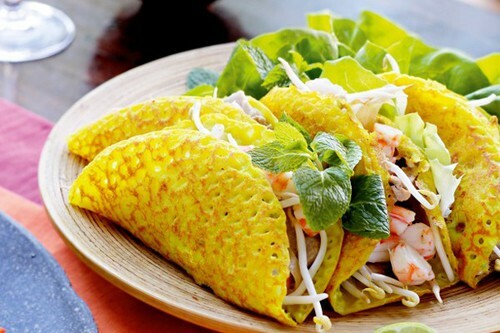 Each region and city has its own variations on banh xeo, but the typical core is made from bean sprouts, sliced papaya, boiled pork and shrimp or chicken, and eaten in a wrap style with mustard leaf, lettuce, Thai basil, and mint. The sauce contains the perfect mixture of spice, fish sauce, and salt to balance the textures and flavours of the dish. Banh xeo is most delicious when eating by hands. You truly have to use all five senses to enjoy banh xeo: listen to the sound of the crispy pancake when you take the first bite, observing and appreciating the stunning colours of the yellow flowers, orange sauce, and green herbs. Let your nose savour the intense smells, and your hands must caress the food as you roll it up, dip it in the sauce, and guide it to your mouth. Banh xeo is a group activity and represents the union of friends and family, it’s a shared experience instead of an individual experience and is used to celebrate holidays and special occasions. A legendary place to get banh xeo in Ho Chi Minh City, and also a favourite of Anthony Bourdain, is Banh Xeo 46A Dinh Cong Trang in District 1. This is a popular location for locals and tourists, and should only set you back $4 per person for banh xeo. The restaurant also specializes in other specialties from the Mekong Delta such as spring rolls, stir fried beef noodles, and chicken salad. 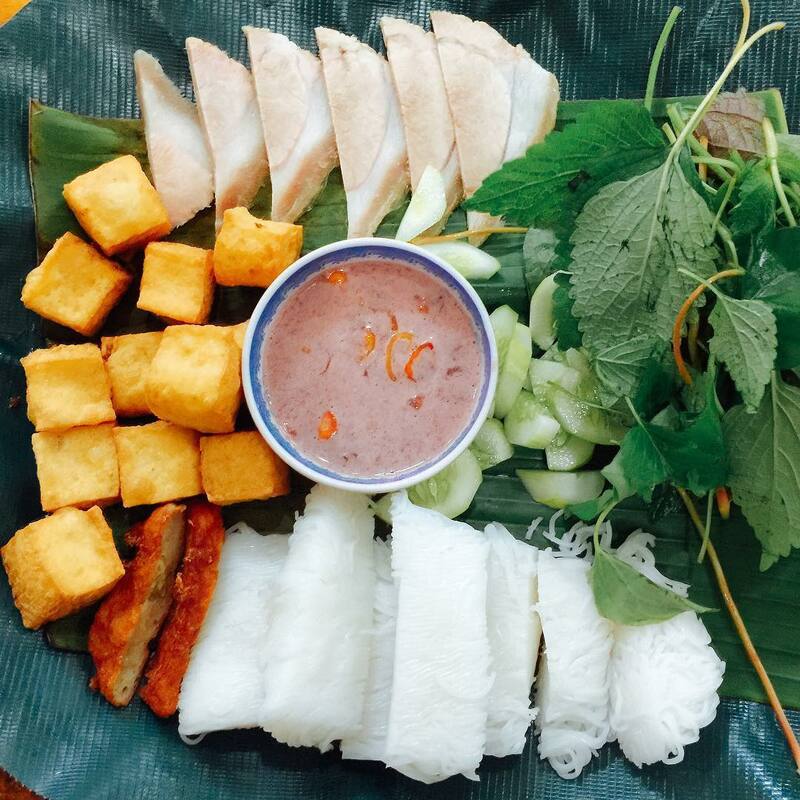 Beauty blogger Michelle Phan reveals this place is her favourite restaurant to enjoy Banh Xeo. Cao Lau is less well known when it comes to traditional Vietnamese food. 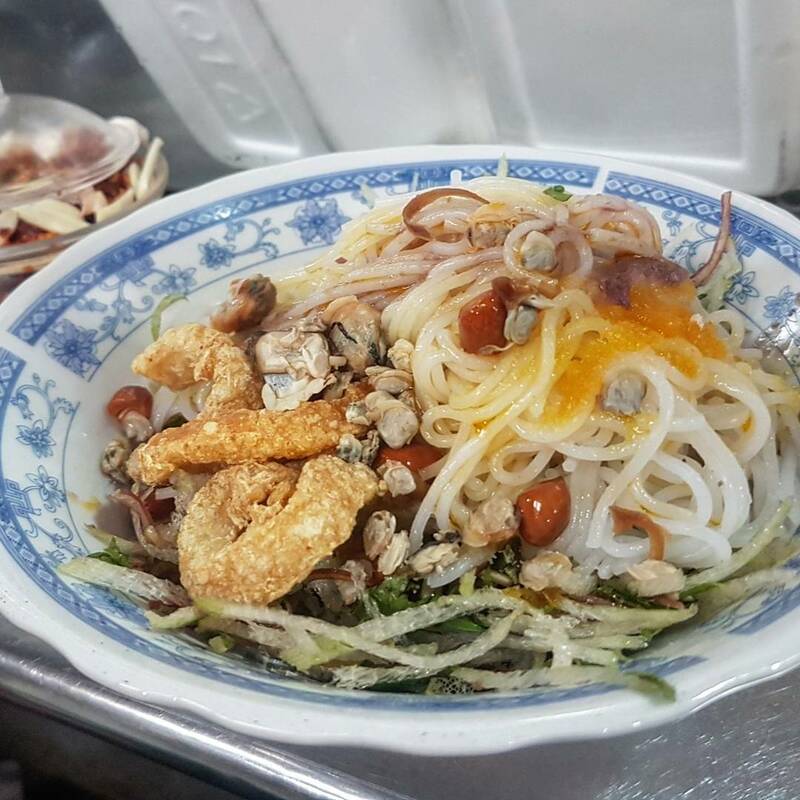 This ancient Hoi An dish appears no different to other kinds of noodle on the surface, however there are some differences that stand out once you know what to look for. It is reasonable to say the cao lau noodle is a combination of the three distinct cultures present in Hoi An: Japanese, Chinese, and Vietnamese. The noodles are thick and yellow, similar to udon noodles, and the barbecued pork, char sew, however there is not as much broth as you would expect in a quang noodle. Find this dish in Hoi An, only there can you truly feel the special, authentic flavor of Cao Lau noodle. Similar to quang noodle, you can taste cao lau with a little or without broth, however you cannot call a dish cao lau without the BBQ pork, cut from the pig’s thigh for the best, firm cut, to produce the sweet broth. The pork is marinated in 5-flavour spice to create the unique flavours that tantilise the eater. Cao lau is best eaten with bean sprouts, fresh herbs, peanuts, and bbq pork sauce on top, with chili sauce, lemon, and fish sauce added to taste. Cao Lau can be found in almost restaurants in Hoi An yet Trung Bac restaurant, 87 Tran Phu, is the place you should visit. The restaurant is a piece of cultural heritage itself as it’s an ancient house that has existed over 100 years. A bowl of cao lau here costs you $.1.5, but there is no chance you will leave having eaten only one bowl. Bun dau mam tom is a rural food of Northern Vietnam. Rice vermicelli is served with fried tofu, pork, chả cốm and shrimp paste. Chả cốm is a kind of vietnamese sausage, a mix of pork and young rice that is fried. It is cripsy and a bit greasy, it decides how delicious a Bun dau mam tom tray is. Bun dau mam tom is a must-try dish for what to eat in Hanoi. Vietnamese dishes attach special importance to balance of ingredient. Bun dau mam tom, with a large amount protein, would be served with numerous kind of raw vegetable including but not limited to perilla, Vietnamese balm, Thai basil, escarole, stinkvine and fish herb. A tray of Bun dau mam tom. To eat Bun dau mam tom, add sugar, chili and kumquat juice into shrimp paste bowl, stir them up and pour the mix into main ingredients. You can easily find Bun dau mam tom restaurants anywhere in Northern Vietnam. There’re some famous restaurants in Hanoi such as Ma May Bun dau mam tom restaurant, 1B Ngo Tram restaurant, Ho Tung Mau restaurant. The price of a tray usually is around $2-$3. In Ho Chi Minh City, you can find some Bun dau mam tom restaurants of Hanoian emigrants; for example, Ha Noi restaurant on Ngo Tat To street, Rau Kinh Gioi restaurant on Pham Hong Thai street and so on. 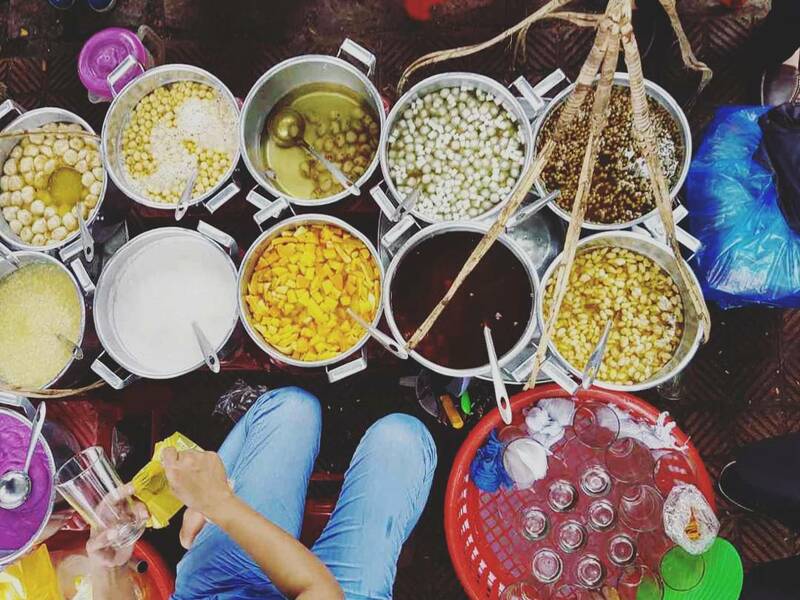 Bun/com hen are well-known traditional dishes of Hue, Vietnam’s ancient capital. Eaters can choose white vermicelli, rice or congee to eat and order a bowl of baby clam soup to have with it. The fresh baby clam is picked up at Perfume River, soaked in rice water so the clams will get rid of mud and sand then boiled until they open their shells. The boiled water will be added some spices to be served and called baby clam soup. The dishes are served with rice, congee or vermicelli, raw vegetables and various ingredients such as cooked peanut, mango, sesame, fried pork skin, and shrimp paste. Bun hen is cheap, a bowl costs around $1. Here are some authentic Bun/Com hen restaurants in Hue: Ty Hon Restaurant (3 Han Mac Tu Street), 171 Restaurant (171 Tran Phu Street) or Ba Cam restaurant (2 Truong Dinh Street). Che is a traditional sweet dessert of the Vietnamese with various recipes using different ingredients. We can categorize Che into 6 types due to their ingredients. Che using beans and pulses: This type of Che is usually condensed and hot, some served with ice. The Vietnamese can cook Che with any kind of beans: mung beans, white black-eyed peas, azuki beans, red beans, moon beans (an imperial dish) peanuts and so on. Che cooked with rice, grains, tubers and cereals: usually served hot. This kind of Che comes with various ingredients from corn, cassava, young rice, water lily bulbs, basil seed drink, lotus seeds to taro. Especially, the Vietnamese have Com Ruou (mildy alcoholic chè), it’s made of rice that is not sweetened with sugar but let fermented, served with ice so it has special taste. Jellies: including agar jelly, jelly with Tiliacora triandra extract, grass jelly and vermicelli-like jellies. A Che shop in Hue street. Dumplings: There are Chè bột lọc (with small cassava and rice flour), Chè con ong (from glutinous rice, ginger root, honey, and molasses), Chè bánh xếp (a tapioca skin dumpling eaten in a coconut milk), Chè trôi nước (balls made from mung bean paste in a shell made of glutinous rice flour). 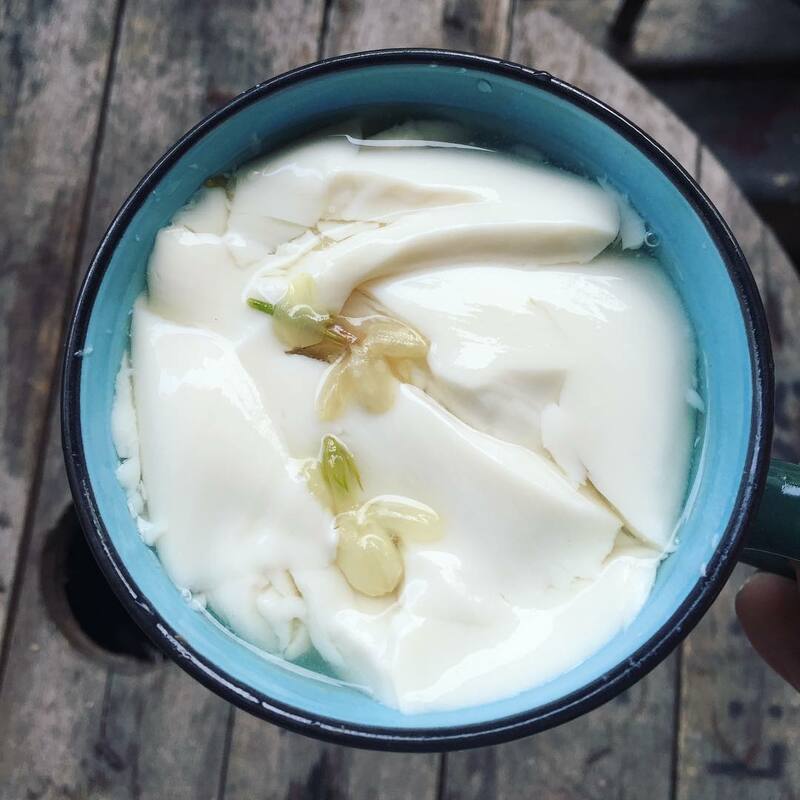 Che made from fruits and plants: the most favorited fruit che is Chè hoa quả (mixture of different fruits including watermelon, apple, pear, mango, lychee, jackfruit, dried banana and dried coconut) which is served with milk, yogurt, and syrup. Other remarkable Che dishes are logan, mango, lychee, grapefruit, banana, durian and so on. Savoury Che: Chè lạp xưởng (made from Chinese sausage), Chè bột lọc bọc thịt heo quay (made from roast pork) and Chè trứng đỏ (made from eggs). Tofu – a foreign Che in Vietnam, originated from China. There are also some foreign Che come from Thailand, Malaysia, Singapore and China that are popularly sold in Vietnam. Ho Chi Minh City is Vietnam’s commercial center.And another most popular attractions in Ho Chi Minh City is the museum. It has been attracting tens thousands foreigners’ attention. 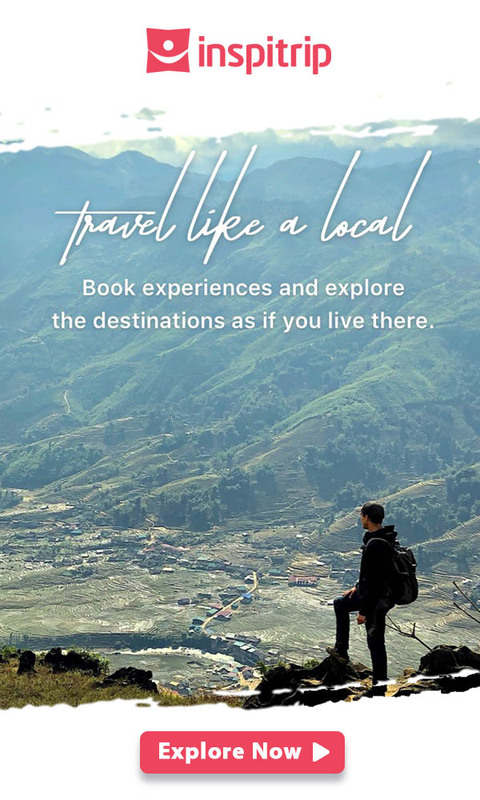 You must follow a tour operator when you are in Vietnam. The tour operators always take care of everything like “Nadova Tours” . Always go for the one that provides excellent accommodations and food.